KENNEDY HIGH the global school was established in the year 2005 and since then it has achieved many milestones. After every successful endeavor the school introspects and restructures its pedagogical and infrastructural resources to equip the students with best teaching practices aiming child-centric education. The three essential pillars of the school are the Pre-Primary wing, CBSE Wing and the Cambridge Wing which are supported by the visionary management, a team of passionate teachers, enthusiastic learners and dedicated admin staff. With over 3000 students on the campus, KENNEDY HIGH has successfully completed 14 batches of class X and 8 batches of class XII CBSE respectively. The Cambridge Wing is affiliated to the University of Cambridge, London, has a strength of 597 students and successfully steered 9 excellent batches of Primary Checkpoint, 6 batches of Secondary Checkpoint, 4 batches of IGCSE and 2 batches of A level. Our students have held our heads high in all fields may it be academics or sports. Students have joined prestigious Universities and colleges abroad and in India. They have proved themselves by taking admissions in courses like MBBS, Engineering, Communication, Biological Sciences, and Architecture etc. At present our ex-students are studying in Universities like University of Illinois – Chicago, University of New Castle- Singapore, Wisconsin University – United States, Rhinwal University- Germany, Xiamen University – Malaysia, IIT-New Delhi, JIPMER University – Chandigarh, India etc. 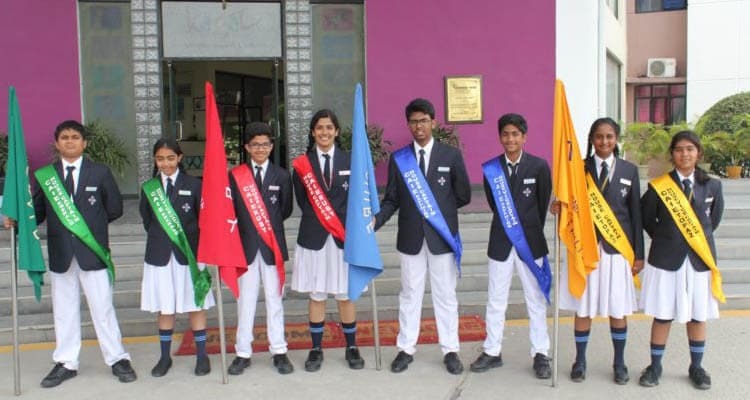 Students of our school have brought accolades by not only scoring academic excellence but also bagging full time scholarship for Swimming coaching at the prestigious British International School in Thailand, representing India at International levels in Chess, Karate, Skating, Tennis, Fine Arts, Performing arts and many more. Learning at KENNEDY HIGH is the most ecstatic, stimulating and a never ending practice for the students as they move on successively to new statures every year. Every living being is sustained through the five elements of nature that is Earth, Air, Water, Fire and Space. KENNEDY HIGH the global school takes inspiration from these elements which create a balance and harmony not only in the students but also in the environment. Earth symbolizes energy and stability, Air indicates movement and change, Water represents fluidity, calmness, depth, resilience and purity of thoughts and ideas, Fire stands for vitality and passion and Space signifies the vastness of our potential, openness and encompasses the other four elements. Thus, there is a sweet comfort in knowing that we belong to them, all. Harnessing and uniting these elements creates a force which helps a human being to become aware and responsible. The emblem of KENNEDY highlights this essence of “Panchbhoota” and ensures that ‘Where there is energy, there is life’. The philosophy of the institution is founded on the belief that education is all about joyful learning. The curriculum is customized to be relevant to the current-day expectations of the professional world. Learning at KENNEDY HIGH the global school is skill-based, child-centric and growth-oriented. The curriculum is dynamic, innovative and experiential, which makes the learning process an enlightening one. While the academics, sports and cultural activities are aimed at personality development of the child, activities like national and religious festivals celebrated on the campus develop harmony and respect for each other, inducing a sense of brotherhood, caring and sharing. KENNEDY HIGH the global school spreads over a sprawling 5-acre campus in a state-of-the-art infrastructure and an amicable environment. KENNEDY HIGH the global school is a 30-minute drive from the heart of the city. The school building is based on contemporary architectural design ensuring a balance between ultimate comfort, beauty and safety. The exquisite landscaping adds an aesthetic touch to the whole campus. Built up area of 2, 10,000 Sq.ft. A beautifully equipped pre-primary wing catering to little ones. Senior secondary school affiliated to CBSE (Classes I to XII). Centre for Cambridge International Examinations from Grade 1 to A Level. Integrated Foundation Course for IIT/JEE. Air-conditioned indoor auditorium for cultural activities. Hygienically maintained air conditioned dining hall. Computer laboratories with high-end systems with dedicated broad band. English language laboratories for honing communication skills. Well equipped library with separate sections for reading, reference & periodicals. Full time professional counsellor, to guide the students in optimizing their performance. Sri S. Jamala Reddy took over as Chairman of KENNEDY HIGH the global school in the February 2007. Mr. Reddy has a rich administrative experience for more than three decades with A.P. State Government and he retired as Chief Engineer. Mr. Reddy entered the field of academic administration in 1999 and took over as President of Lakireddy Balireddy College of Engineering at Mylavaram, Krishna District. After successfully developing it as one of the most sought after Engineering Colleges, he laid a strong foundation for the future of thousands of engineering graduates. His zeal to bring marvels in the field of education made him take over the management of KENNEDY HIGH the global school in the year 2007. It was under his able guidance that two independent curricula CBSE and Cambridge were introduced. Due to his visionary and perseverant attitude he set the foundation of the two pillars of KENNEDY HIGH the global school from Pre-Primary 1 to class XII in CBSE and Grades 1 to A Level in Cambridge. Under his dynamic leadership the school has marked a phenomenal growth since then and reached a strength of 3000 students today. He is not only known for his passion of introducing new teaching methodologies, professional ethics, but also is a mentor who invigorates hard-core values in today’s generation. He has left no stone unturned in striving for excellence in taking KENNEDY HIGH the global school to a new pinnacle. An engineer by profession, Sri Subba Reddy has worked in various organizations in the private sector. A stint in the USA in the Information Technology sector has broadened his perspective. He is the man responsible for the entire civil construction of the school project and he is the director, in-charge of day-to-day functioning of the school assisting the chairman in all the administrative, managerial and financial matters. A highly renowned Gastroenterologist based at Merced, California, USA, Dr. Siva Kumar Reddy.M ‘s love for education led to his active involvement in his promoting KENNEDY HIGH the global school . His strong belief in professional ethics and moral standards is a source of inspiration. A highly successful entrepreneur based at Berkeley, California, USA. Mr. Venkat Reddy made his mark in real estate and hospitality industry. His generous contribution for the development of a high school in his native place Bheemavaram, Khammam proves his commitment to impart quality education for underprivileged children in India. He says KENNEDY HIGH the global school is only the beginning in the long journey to establish more number of educational institutions. Managing Director of Nightingale Hospital, a successful hospital at Guntur, Andhra Pradesh, Dr. Sudhakar has been providing yeomen service in the medical field. Nightingale Hospital in Guntur enjoys a reputation of trust and belief. His keen interest in the field of education and his desire to contribute to society drew him into this project. A surgeon of high repute, Dr. Sudhakar brings with him his passion to create the right educational environment. A dedicated General Practitioner of medicine at Merced, USA, Dr. Jaipal Reddy.M ,has served at various hospitals in India and US. His aspirations for an idealistic-learning environment led him to contribute towards the realization of this unique vision called KENNEDY HIGH the global school. A successful nephrologist and an accomplished learner, Dr. Atul believes that learning is a perennial process. His extensive work in the medical world through research, publication and clinical contribution has won him many accolades and commendations across USA. With his dynamic attitude and ever-smiling demeanour, Dr. Atul Roy is charm personified and is, no doubt, a progressive member of the mission called KENNEDY HIGH the global school. Through various innovative and creative teaching practices and collaborative programs with parents, we aim to provide holistic education focusing on life skills, soft skills, social consciousness, global values, and foster an environment of knowledge creation. We aspire to create a stimulating and challenging learning environment that facilitates spiritual, moral, intellectual, social, emotional, and physical development and sets high expectations for personal excellence for our students and mentors. The Vision of KENNEDY HIGH the global school is to mould the young minds to be independent, lifelong learners with 21st century global skills, equipped with superlative academic and social competencies, which enables them to enter into the mainstream of society as confident and empowered citizens. KENNEDY HIGH the global school is promoted and managed by KENNEDY HIGH the global school Educational Society which was incorporated under the societies Act on 28th January 2004. The construction of the buildings was taken up during January 2004 after obtaining all statutory approvals from HUDA and other agencies. The school started functioning from the year 2005 with its first Academic batch in the year 2005-2006. School council plays a pivotal role in developing the personality and leadership skills of a student. Student Council members are given opportunities to present their opinions and make valuable recommendations to the Principal on matters affecting the student body. The school has a House System to foster leadership qualities, a sense of belonging and to ensure healthy competition. 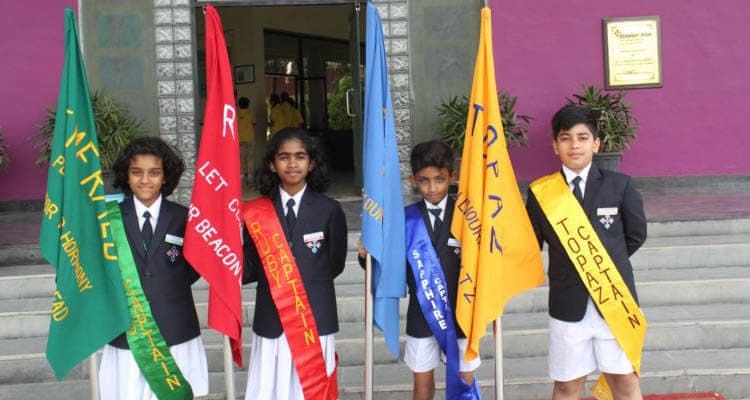 In order to develop a sporting spirit and provide each child a platform to showcase his/her talent, every student is placed in one of the four Houses, where various inter-house activities are conducted throughout the academic year. The student cabinet is headed by the Head Boy, Head Girl, Deputy Head Boy and Deputy Head Girl, supported by the Captains and Vice-Captains from all the four Houses. The maintenance of discipline and cleanliness of the school is the responsibility of the House on Duty. 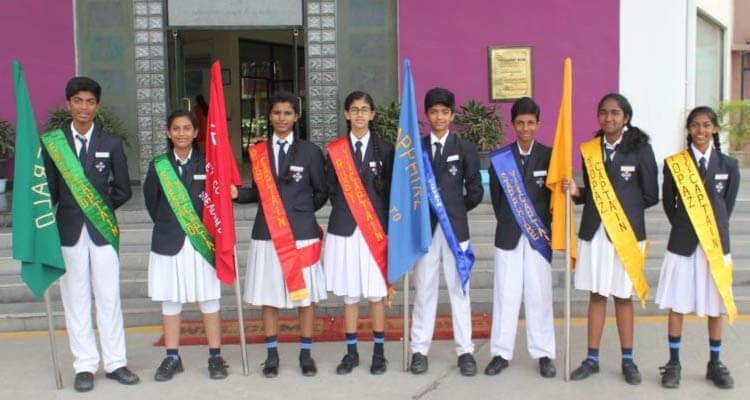 The Student Council comprises of different governing bodies viz., Math Club (Octave), Science Club (Expedition), Social Science Club (Heritage), Language Club (Expressions), Cultural Club, and Sports Club, each body having a president, a secretary and members. There is also an Editorial Board with an Editor, Deputy Editors (Art & Photography) and special correspondents to bring out school publications (Magazine, News Letters etc). “Best School In India Award”, 2015-2016, added another feather in the cap for KENNEDY HIGH the global school, Hyderabad, a prestigious moment for receiving the “Best School In India Award”, for the second consecutive year. The school actively participated and showed excellence in the United Nations Decade of sustainable energy for All India Program Rio+22, Energy Conservation Certification Course, which was conducted by centre for United Nations. Over 400 students of classes V to X from CBSE and Cambridge wings participated in the event and successfully completed the course with excellent grades. The main motto was to create awareness about the environmental degradation and sensitize the youth about the depleting resources of Mother Earth. 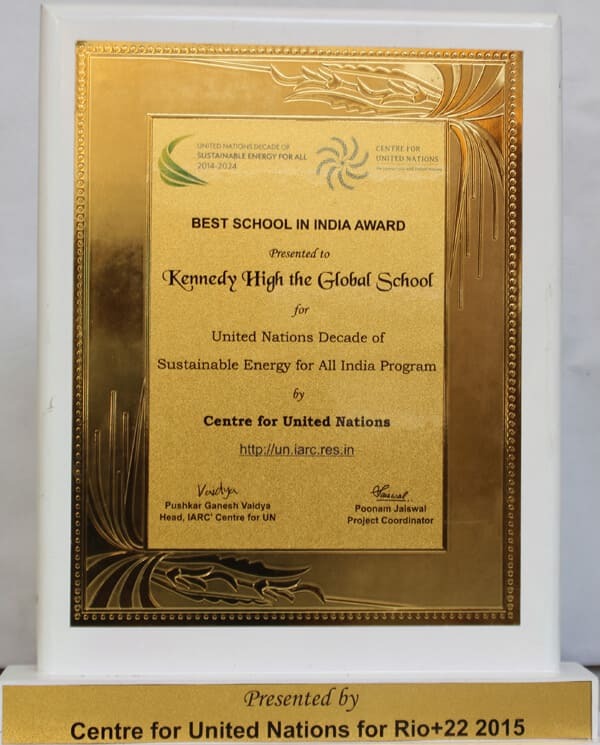 KENNEDY HIGH the global school emerged as the Best School at the all-India level for Rio+21UN International Year of Water Cooperation India Program (2013-2014). A Gold Plaque commemorating the achievement was awarded to the school by the Indian Astrobiology Research Centre (IARC’), centre for United Nations. Vivekananda Excellence Award KENNEDY HIGH the global school becomes one of the few select schools to be awarded the prestigious ,”Vivekananda School of Excellence Award” organized by the Central Board of Secondary Education. Health and Sanitation Award KENNEDY HIGH the global school received the coveted National School Sanitation Award instituted by the Ministry of Human Resource Development. This national award carries the highly esteemed “green label” ranking for the school.